As the rumours continued to swirl like the nearby Hurricane Matthew, TNA continued to move forward with the first episode of IMPACT Wrestling since Bound For Glory. With Lashley choosing to face Eddie Edwards in the main event with the World Heavyweight Championship on the line and The Decay, Trevor Lee, Gail Kim, Andrew Everett and Mandrews all playing a major role in the show...this was going to be awesome...right? In a big storyline twist, Eddie Edwards collected his first World Heavyweight Championship with a victory over Lashley, after the former Champion had picked Edwards as his challenger as the easiest option from a selection that also included Ethan Carter III and Moose. This lead to short but enjoyable main event, that told a strong underdog story as Edwards fought against the powerful and dominant champion Lashley. The Destroyer kept things simple, as following a German Suplex that appeared like it was about to kill Edwards, Lashley controlled the pace and took his time to wind up the crowd. Even though the crowd seemed to side with Moose to get a title opportunity, they quickly got behind Edwards, helped by the structure with Edwards getting a number of exciting hope spots that would always be cut off by a big power move. The finish was very well done as Edwards caught Lashley with a Boston Knee Party as Lashley came flying in with a spear attempt. With this ending the show, it left me wanting to see what would happen next and how different the show would be next week. Good work from everyone involved. Unfortunately the "Wolf Creek" Cage Match was less enjoyable, as Brother Nero (Jeff Hardy) & "Broken" Matt Hardy defended their World Tag Team Championships against The Decay ("The Monster" Abyss and Crazzy Steve) in what boiled down to being an advert for a new show on Pop. Firstly, I was a little uncomfortable with the idea behind the gimmick, which showed similarities to the Ambrose Asylum match that WWE did earlier in the year and various other gimmicks, but according to the commentary team were "the weapons of choice" of a famous Australian serial killer. Why? Because Pop are doing a show about him. Secondly, the conclusion to the match didn't even air because of technical difficulties, forcing TNA and Pop to put the match on Youtube. A couple of weird weapons got involved, like a weird grappling hook and Reby Hardy (Reby Sky) hitting Rosemary (Courtney Rush) with a rabbit on a stick, but there was nothing that made me sit up and take notice. After the hot Great War from Bound For Glory, this match seemed to take all the momentum out of the feud. The show began with a cool segment that saw all the champions in TNA come to the ring to argue their case for being the true champion of the company. For those not keeping score that meant Lashley, Aron Rex (Damien Sandow), Gail Kim, "Broken" Matt Hardy (no Jeff for unknown reasons) and DJ Z (Shiima Xion) all in the ring. This segment had the feel of a reboot, as each champion was introduced and the concept of each division was explained during the conversion. This therefore makes this episode a great jumping on point for anyone who is fancying giving TNA another chance. Billy Corgan (accompanied by Aiden O'Shea) would eventually come out to announce the plans for the evening, where all the titles, bar the X Division belt, would be on the line, as well as setting up the gimmick for Lashley's title match. A solid opening segment, that made it clear what the viewer would be getting throughout the rest of the evening. Cody (Rhodes) had his first appearance on IMPACT Wrestling, alongside Brandi Rhodes, addressing the crowd, before ending up in a brawl with "The Miracle" Mike Bennett and Maria Kanellis-Bennett. This was a great piece of television as Cody introduced himself well to the audience, putting over a number of event from the PPV, whilst also taking his time when telling stories. Cody talked with passion about wanting to win the World Heavyweight Championship and also mentioned that Bennett was on the list of competitors that he made when he left WWE earlier in the year. Once Bennett and MKB were out, the performers worked the crowd well getting them to chant "Cody" repeatedly, before Bennett would up his game and produce some real fire on the mic. It worked so well, because Bennett having gripes about Cody having a title shot, made complete sense and was delivered with such conviction. It was easy to believe what Bennett was saying and therefore I instantly bought into the feud. 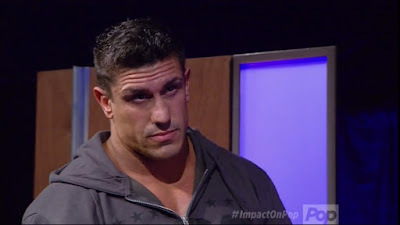 Ethan Carter III would enter a new feud with Eli Drake on an episode of "Fact of Life". This was an entertaining collision, starting off comical with Drake continually pressing his Dummy button every time EC3 tried to speak before turning serious and producing two good promos, including a marvelous effort from Drake. The ability to shift from light entertainment style in an intense situation with ease, should be commended as there are only a few wrestler in the business who can do this well on a regular basis. As good a job as EC3 did with his promo, begging Drake to hit the button so that he could beat him up, it was Drake's effort that sticks out in my mind. Perhaps, it had a similar theme to Bennett's later in the show, but it worked just as effectively as Drake bought the passion, talking about his run in TNA and how he's worked to get to the spot he was in. Let's not forget that Drake has title shot thanks to his Bound For Gold win and a fiery feud with EC3 could set him up for a title win next year. Credit to both guys for making me want to see them fight again! Team X Gold made it's debut this week, as X Division Champion DJ Z, Braxton Sutter (Pepper Parks) & Mandrews (Mark Andrews) went over Andrew Everett, Marshe Rockett and Trevor Lee in a fun six man tag. In terms of the action this was a good debut for the Team X Gold, because it was pacy, used the trios match style well and included plenty of exciting action over a short period of time. It was great to see Mandrews get the pin and get a proper chance to showcase himself well as I've been willing TNA to start using him correctly. This was actually Mandrews first win on IMPACT Wrestling since July 2015! Unfortunately, I still have absolutely no idea what Team X Gold is. There was nothing before the match to explain it other than it was an idea of Billy Corgan and Z, whilst Josh Matthews attempts to get over the concept on commentary was a bit of a mess. "Once you see a team established, they will stay a team" What? "The referee will enforce the rules more" What? Aron Rex retaining the Grand Championship over The Tribunal's Baron Dax in a solid encounter that ended abruptly with a second round submission. Gail Kim retained her Knockout's Championship despite a dominant performance from Sienna, before Sienna, Maria Kanellis-Bennett & Laurel Van Ness took part in a beat down of Kim, as Allie looked on.